It’s already been a year since we first wrote about Dunder Casino in our guide. Time sure flies when you’re having fun and that’s why the team over at Dunder created a baffling party with the most phenomenal prizes you can imagine! 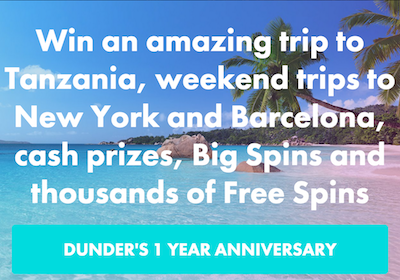 In order to celebrate their very first birthday Dunder is offering a chance for you to win fantastic trips to Tanzania as well as New York and Barcelona. Other than that you will be able to win both cash prizes, Big Spins and free spins. In other words – you don’t want to miss out on the biggest promotion yet that Dunder has to offer. If you’re not a member we recommend you to read our review and then sign up at this cool casino if you think it will suit you. The fun will continue until the 2nd of April 2017. During the promotion period you will get one ticket to the draw for every £20 you decide to deposit to your account. As if this wasn’t enough you will also be able to complete daily assignments at Dunder in order to get more tickets and some refreshing free spins. By completing daily missions you will get extra tickets to the big draw at Dunder. And if you complete at least three missions during one week you will get 10 bonus spins on a selected video slot. This week it’s Phoenix Sun. However if you complete the missions every day during one week you will receive 50 free spins instead. The 1st prize up for grabs in the raffle at Dunder Casino is an adventure in Tanzania for two persons. You will get to go on a real safari as well as you will be able to enjoy relaxing days on the beach. This prize includes flight tickets as well as an all-inclusive hotel stay with a safari experience. Dunder’s 2nd prize is a weekend in New York for two. The package includes everything from flight tickets to four nights at a luxury hotel on 5th Avenue together with £1000 in pocket money. The player claiming the 3rd prize will get to go on a weekend to Barcelona with a friend. Flight tickets, three nights at a hotel and £500 in spending money included here too! Except for these prizes Dunder will give away cash prizes as well as Big Spins and free spins on the thrilling video slot Hot Sync.